Lloyd Suh wants us to look and then consider what our gaze does when we do. In his play, The Chinese Lady, what he has put before us is the historical figure of the first Chinese woman in America, Afong Moy. But not really. First off, that was not her name. She was renamed by the people putting her on exhibition. Moreover, this is a play. A performance. A simulation with an actor, costumes, props, and a script. In real life, she was displayed before an audience at a museum and later by PT Barnum…with props and certain choreographed gestures. This is totally different. Isn’t it? But we too have paid our money to watch her and learn something about her. Have we changed much from those who first came to gaze upon her? When we look, what do we see? 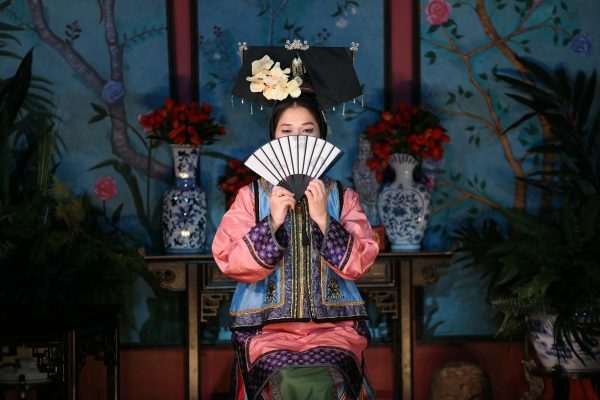 In Suh’s play, she is an expressive and garrulous woman (the delightful and precise Shannon Tyo), with a dedicated interpreter Atung (Daniel K. Isaac with comedic flair) whom she deems irrelevant (he agrees). She speaks to us but it is not an exact recreation of what she might have said or expressed to audiences watching her in 1834 when she arrived in America only speaking Cantonese. She adapts, speaking English, so that we may understand her fully. But again, she is both a historic figure and a creation of Suh’s because no one actually knows what she said or thought. No one ever bothered to interview her. We cannot know exactly what this scene might have been like but also we are an audience which has likely seen more of the world, experienced other cultures, and would not find the body of a Chinese woman so rare, foreign, remarkable, or exotic. Or are we? Suh’s framing in the play frequently references our gaze, representation, and cultural appropriation. He works hard to subtly hold-up this dual lens of America in the 1800’s and America today. As a white woman watching this play, I cannot forget the ongoing violence, erasure, and power of the white gaze on Asian bodies. While immigration of Asians to America may have increased over time many Americans still struggle to see people of Asian-descent as American (the poisonous refrain, “where are you REALLY from” remains a weapon). Asian women are still talked about and fetishized in our culture. While we may not display Asian women like jewels in a Chinoiserie box and watch them eat with chopsticks as Afung Moy was, we may want to consider how we still find ways to other them. While this all may sound quite dark, Suh and director Ralph B. Peña largely employ a lighter touch. Afong Moy and Atung have a comedic rapport. Moy is herself an engaging hostess to the play and its storytelling (helped immensely by Tyo’s performance). Peña stages the production to keep past and present at the forefront of our mind. The play opens with a contemporary Chinese shipping container which when turned and opened becomes the parlor where Afung Moy was placed, surrounded by Chinese vases, paintings, and tapestries–an exhibition “box” meant to recreate a room in China. With Afong Moy, her “exhibition,” and objects, Suh is playing with the idea of how much cultural interaction is “sharing” and how much is “taking.” While the character, at first, as a teen is excited to share her culture and her “graceful” use of chopsticks, she is also eager to reveal her understanding of the cultural differences she has discovered in America—the indelicate use of forks and people wearing shoes indoors. She may be less enthusiastic about repeatedly parading around her room to demonstrate for the audience how she walks on her tiny feet, a product of traditional foot-binding. While some may see her foot-binding as barbaric, she points out the barbarism she has spotted in the traditions of American culture—“corsets,” “transatlantic slave trade.” Touché, Afong Moy. The structure of the play is intentionally repetitive. Afong Moy reiterates her presentation in her “box” over and over as the years pass by and as her situation changes. Evocative lighting by Oliver Wason helps to set the mood for each of these scenes. We see her from age 14 to 82. She relays the events happening around her—the California Gold Rush, increased Chinese immigration, the Civil War, the Transcontinental Railroad, and the passage of the Chinese Exclusion Act. With some of these recitations, she becomes less Afong Moy and more a voice for the Chinese in America. The play loses some of its power with this shift. While the historical context is interesting, the intersection with Moy does not deliver as much of an emotional payoff as her own growing sense of cultural confusion does. While “representing” China to the Americans, over time she herself has become an object of the past as China has changed while she is no longer there. But still must perform it for others. As the years pass and she ages, her youthful pleasure in her “work” dissipates. Moy’s first-ness means a profound sense of isolation. Tyo, through a pained smile, shows Moy’s increasing struggles with her role. How long can you perform your own identity? When do you lose yourself in the process? While she may have seen some utility in this endeavor at the start–cultural exchange and mutual understanding perhaps–by the end she is wounded by the emptiness of her gestures and how she has not cured white America of its preconceived notions or stemmed the tide of racial violence. While the play can feel in moments didactic, it churns up deeply felt issues of immigration and cultural identity which go far beyond one Chinese Lady.